I am always filled with a sense of adventure and excitement when the New Year comes around. Maybe it’s because I was born on New Year’s Eve and everybody is celebrating, although not because of my birthday. Or maybe it’s because I’m hopeful that better things are standing at my threshold than those of the previous year. Let’s face it, 2010 has better possibilities to offer me than my mother’s death, a pay decrease, and the bathroom pipes springing a leak. I feel the same excitement about my writing. I started my newest writing project last June and hope to be at least ¾ of the way, or even closer to the end, by next December. I get all jittery inside when I think of 365 days of writing opportunities, and I have intensified my enthusiasm by taking a week’s vacation in January to get a running head start. Reevaluate Your Writing Career: Take note of what you achieved as a writer in the previous year and what you want to accomplish in the coming year. Make goals to achieve this new direction. Resolve to Write: A writer must commit to produce. Without the will, there is no way. Set goals of when, where, and how often you will work. That way when friends want to distract you, you will be ready to politely turn them down. Set Realistic Goals: If you set your goals too high, you are sure to fail or at least overextend yourself in the process. Moderation is the key to all writing pursuits. By setting lower goals and surpassing them, you will feel more successful and spare energy for other writing endeavors. Add Variety: Sometimes I get bored with the same piece of fiction day in and day out. I keep a variety of writing projects at hand to stir up the muse. Journal writing and blogging also keep me writing, and these outlets are cathartic ways to practice the art. Just don’t overdo the variety and neglect your more important projects. That would defeat the goal. Finish Old Projects: There is nothing more stifling or draining than unfinished writing tasks. Their constant cry for completion is like an invisible shield that blocks free thinking. Finish these annoyances and you will unclog the passageways that hold back creativity. Read More: I’ve said it before, and I’ll say it again: We can learn how to write by reading other writers’ works. The way they use words and the way they structure plot can spur us out of writer’s block and help us handle plot in better ways than if we attempted the task in a stupor. Focus on Your Successes: Dwell on the things that you do accomplish this year instead of on what you don’t. Failures aren’t really failures. They are just methods you’ve tried which don’t work. Attempt different techniques and ways of approaching the subject and you might turn the piece into one that works. But until then, be kind to yourself and pat yourself on the back for all you have achieved. Submit: There is only one thing to say about submission. If you submit, you provide opportunities to get published. The opposite holds true if you fail to do so. Be Confident: Wherever you are on the publication scale, don’t think your failure to get your work out in the world makes you a bad writer. I hate to say it, but sometimes publication depends on timing or whether or not the editor had a fight with her husband that morning. Your abilities aren’t necessarily the reason you haven’t seen your name on a book cover. Promote Yourself: And do so whenever you find the opportunity. Promotion is a vital part of a writer’s success. You might hand out business cards, or contact an editor, or be bold and tell everyone you talk to you are a writer. If you’re like me, this part of the equation is difficult, but critically important if you want others to know your work. Such are my ten resolutions to keep moving forward on my novel in 2010. I hope those of you who read this little list may find solutions to some of your own writing dilemmas. The Grinch who stole Christmas is alive and doing well. Four days ago my son called me at work and screamed into the phone, “Mom, there’s water in my closet.” Several hours later, a plumber discovered my bathroom sink pipes had sprung a leak and that the walls behind the bathroom were completely saturated. This resulted in the dry out company cutting holes in my closet and bedroom walls, as well as ripping up carpet, my bathroom floor, and installing nine fans that have tried to blow through my Christmas and writing plans. I must admit, at first I didn’t handle the shock well. As I cried in my Christmas pudding, complained to whoever would listen, and slept on my couch for three nights, I realized my sulking just wouldn’t do, especially with a houseful of people coming. Since I couldn’t sleep well on my uncomfortable, makeshift bed, I had a lot of time to reflect on my attitude adjustment. After all it was turning out to be a Whoville Christmas, and I couldn’t allow this unexpected inconvenience to ruin the holiday. I realized I have the Gospel, family, my health, good friends, a roof over my head, and talents. The true meaning of Christmas always exists and for everyone, not just in perfect circumstances. The Savior was born and blessed this world with love and a better way, and the sooner my face reflected these facts, the sooner I could spread this message to everyone. Although all my Christmas money will go to the deductable, I do have homeowners insurance and will get the tile that has sat in my garage for two years finally installed in my bathroom. I was also able to enjoy my family yesterday and put on a nice dinner for all. What more could I ask for? As for my writing plans, well, although somewhat delayed, I’ve found a little hole between the food storage buckets and misplaced furniture to write this blog post today. The chaos has given me a different perspective and definately something to write about. I’ll get to my novel later on, too. I will always remember Christmas 2009 and how it reminded me of my blessings. Merry Christmas everyone! It truly has been a good one! As I sat in my monthly writers meeting last night, we were asked to tell the group about our latest writing projects. When my turn came around I stammered and stuttered, and by the time I finished trying to tell everyone what my book was about, I shrunk in my chair, red-faced, wondering if I sounded as lame as I felt. Mind you, I’m far better at the written word than I am at orating. If I have to speak in front of small groups, unless I prepare on paper what I’m going to say two weeks in advance, my tongue goes numb and my brain springs a leak. Yet, I wondered if my speaking engagement would have been easier if I had known precisely, in only a few words, what the core of my story was about. A couple of months ago I read an article by Randy Ingermanson on his snowflake method for writing a novel. He suggests that as we begin, we should define what the story is about in a one-sentence summary using fifteen words or less. That shouldn’t be too hard, right? Try it. You’ll see just how difficult the task really is. Second you need to determine which of your characters has the most to lose and figure out what he wants to gain.”A deceitful archeologist must convince colleagues he’s unearthed an artifact revealing the world’s end.” The sentence needs to be concise enough that you can later use it to sell your book to anyone. I keep thinking if I had already accomplished this assignment for my current manuscript, I would have aced the task of selling a room full of writers the plausibility of my story. Ingermanson says to search The New York Times Bestseller list for examples of concise one-sentence summaries. I go to this list often and read the short sentences not only to know what fiction is popular, but also to learn ways of honing in on the heart of a plot. I suggest you give yourself at least an hour to find the most compact way to describe your novel’s basic thread. After you try the exercise, please comment below about the ease or difficulty you experienced. I hope I’m not the only writer who finds this drill a challenge. 2010 ANWA Writer's Conference Is Coming! I’ve stopped listening to the radio on my drive to and from work. The noise was a distraction, filling my mind with repetitious tunes and everybody’s thoughts but my own. I’ve discovered that in the stillness, competition for head space has dwindled to a minimum, and I’ve created a healthy environment for the development of plot ideas, blog posts, and ways to improve my manuscripts. These quiet moments are crucial for a writer’s success. Besides the dreamless, Delta levels where our subconscious often inspires us in our sleep, in today’s busy, over-stimulated world we must create special moments where our brains can engage the muse, a place where we can focus on the next passages we are going to write and the crowning ideas that are trying to immerge. Not all of us have two hours to kill in the car every day like I do, so how do we find ideal places and specific times for productive thinking? I used to ask myself that question all the time, but it wasn’t until I practiced the fine art of being still that I realized how many opportunities I really had during a day. Below are just some of the ways I’ve found to reconnect my synapses. If you try any of these, don’t forget to keep a pad and pencil with you to write down the ideas that begin to flow. » Create a sanctuary in a remote corner of your house – Decorate a special corner all your own with some of your favorite items that generate peaceful surroundings. A candle, pictures of family, a floral arrangement, or a special pillow can work magic in this haven away from distractions. Put up a partition to keep your attention reigned in on your work. Before long, you’ll wonder how you ever wrote a sentence without this refuge. » Take a walk outside – Fresh air and exercise are cures for a stagnant existence. Twenty minutes away from your desk can wet your imagination and get you back to writing again. » Get up an hour earlier – Even a half hour earlier might give you a few moments to jot down some ideas that you can develop later on in the day. » Use down time at work to brainstorm – Between work projects or during a break, write lists or send yourself Internet data that will help improve your writing sessions when you have more time to develop the information. » Stay out of the break room at work – The break room is notorious for wasting time. Well-intentioned people want to talk to you when you want to write. Find an empty desk somewhere in the office or park yourself on an outside bench where no one will find you. Your colleagues will begin to respect your desire for alone time. » Keep a writer’s journal and use it daily – the moment you wake up is a good time to write down ideas. But carry your journal with you and get in the habit of using it whenever you feel inspired. » Use the time in grocery store lines to observe action and dialogue – We spend half of our life standing in one line or another. Make the most of those wasted moments by writing down someone’s quirks or the dialogue you hear. You never know when a phrase or oddity might come in handy in one of your plots. » Refrain from watching television, blogging, or listening to the radio for a day – All the vices of networking and the media can be the worst bandits of our time. Listening to repetitive plot ideas and the same music over and over only locks our mind into someone else's patterns of thought. Social networking and video games may exciting and fun, but they do not help us congregate where we most need to be: at our desks writing. Tune out and tune in to your own unique ideas and you'll be producing abundantly before you know it. The key is to train yourself to find ways to be still. Remember that as we discover more of these moments in our lives, the easier it will be to find them again. And the more productive we are, the more success we will glean as writers. I am currently working on a novel that deals with the meaning of truth through the eyes of science, religion, and two different cultural backgrounds. Frankly, I’m discovering this is not an easy task. I recently read Dan Brown’s latest work, The Lost Symbol, and was quite disturbed at the conclusions he draws about what is true. I wondered whether most of the world shared his views or if people were able to decipher between what is fiction and what is non-fiction. From the public's response and media coverage of Brown’s DaVinci Code a couple of years ago, I’m beginning to think the general public is not that smart. Since time's beginning, man has argued the issue of what is truth. Just a few weeks ago I started a lively debate with my son about whether or not truth was absolute. He debated that truth is whatever a person thinks it is. I disagreed and, drawing on the scriptures, said, “Truth is truth, has and always will be truth, whether a person understands it or believes it.” This debate continued for a couple of weeks, but without either of us agreeing with the view of the other. I started researching the topic on the Internet and found quite a heated argument taking place. One asked, “If there were such a thing as absolute truth, how could we know what it is?” Another said, “I don't believe there's one truth. There are a variety of people in the world, so there are a variety of ways of looking at things.” One individual went as far as to say, “People who believe in absolute truth are dangerous.” I laughed at that one. I never thought myself as a dangerous person. In my research, I discovered more about these different viewpoints, and so I’ll explain them as far as I understand them. First, the correspondence view of truth, or belief of absolute truth, claims that any statement is true if and only if it corresponds to or agrees with factual reality. Thus questions, commands, and exclamations are neither true nor false, because they do not make claims about reality. To further clarify this view, those who believe in absolute truth claim that any clear-cut, declarative statement must be either true or false. It cannot be neither true nor false; nor can it be both true and false. Either the world is round or it is flat. Those in opposition to truth as an absolute believe in relativism, a view that espouses that truth and morality are relative to a person's situation or standpoint. They deny that any standpoint has the advantage over another and, that since there is no way to prove that something is true, truth has to be whatever the individual or culture deems it to be; it is true only if it works for that particular person or culture. The earth is round, but if another person believes it is flat, then it is both round and flat. Somewhere between the realms of correspondence and relativism is that of pragmatism, a view that truth should be tested by the practical consequences of belief. Pragmatists are concerned with results rather than with theories and principles. 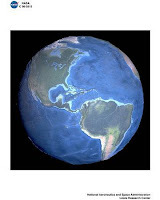 The earth is round because pictures from space verifying that fact exist . Hmm…is it just me, or is anybody else struggling with the latter concepts? If I believe in absolute truth, then either absolute truth or relativism is true. They can’t both be true. If I believe in relativism, both can be true, if I believe it to be so. And if I'm a pragmatist then someone will have to prove that correspondence or relativism is true before I believe either of them. This brings up some interesting questions. » Can anything be considered truth? » Can contradictory ideas explaining two different realities both be true? » If I believe relativism is false, then is relativism false? » Where does truth come from? An individual/culture or from some entity with more knowledge and understanding than that of the world? Or does it spring out of nothing? Does it just exist? » If truth is manifested by an entity with more knowledge and understanding than that of the world, or if it just exists, does mankind have the right to create his own truth? » If truth is whatever an individual or culture decides it to be then will truth really ever exist? » Is proof necessary for something to be true? To me, relativism and pragmatism miss the mark. What do you think? Steven Spielberg has said, "People have forgotten how to tell a story. Stories don't have a middle or an end anymore. They usually have a beginning that never stops beginning." We, who like to write fiction, should pay heed to his message if we want to write compelling stories. A few years ago, while attending college, I discovered the book called, Interactive Writer's Handbook by Darryl Wimberley, PH.D. and Jon Samsel. The fourth chapter, "Story Dynamics: The Spine Comes to Life," tutors us about the Three-Act Play Structure, and it taught me how to craft fiction. The formula isn't new. It evolved from Horace's five-act plays and has inspired Shakespeare and other playwrights through the ages. The Three-Act Play Structure’s purpose is simple: to set a spine into the body of a story. We all know the purpose of a spine; it supports the body's musculature and holds us upright. I used to hang a Far Side cartoon on my wall entitled the "Boneless Chicken Ranch" to remind me that my stories needed a spine. In the comic, boneless chickens sprawl haphazardly on the grounds of the farm. The same principal works in our fiction. If we fail to put a story-spine in place, our plot will sprawl throughout the manuscript, bringing us a passel of rejection letters. Five stages make up the Three-Act Play Structure, helping the author pace dramatic conflict. These stages need to occur at specific times within the story and in specific proportions. The Second Act is longer than the First and Third Acts, and the First and Third Acts are relatively the same size. The ending should somehow connect with the beginning to provide unity. Writers should know how a story will end before they begin so they can repeat a symbol or theme throughout the plot which helps in the unification. The first stage of the Three-Act Play Structure is the Trigger. This stage occurs within the first eight to ten pages of the manuscript. The trigger jump starts the story, involving characters in immediate conflict and promises more struggles to follow. The trigger does not have to involve the hero. The villain can do the job just as well. But remember, the introduction of conflict must affect the character's head and heart. As the main story changes, so should the inner lives of the players, otherwise the author risks leaving the reader unsatisfied. The second and third stages of the Three-Act Play Structure are the First and Second Reversals or Plot Points. Many reversals occur throughout a story, but only the first and second Plot Points are mandatory or the story will crumble. 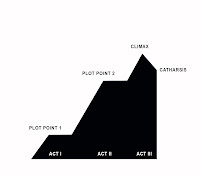 The first plot point occurs at about a quarter of the way through the plot in Act One, and the second plot point occurs at about three quarters of the way through the plot at the end of Act Two. These Plot Points take the story and the characters lives in new directions, but the second plot point is where the main character learns something significant about his mettle. The second reversal introduces the third act, leading to the Climax of the story. The Climax, or fourth stage, is where all action escalates to the main point of the plot. However, the Climax should never answer all of the character’s problems. This allows the final stage, the Catharsis, which the Greeks knew as a type of healing, to tie up lose ends. The Catharsis should be brief. After the climax, readers care very little about what comes after. The Three-Act Play Structure works, whether writing a novel, a screenplay, or a short story. Remember this structure is a guideline only; a writer doesn't have to be exact, just in the general vicinity, although she needs to use all five stages. More times then not, the authors of my favorite novels have used this formula, and I have committed to mastering all five stages so my novels are of the same caliber. Try restructuring your own work. You'll be surprised how your stories improve. I hate pulling weeds. I’d rather be writing. Yet last Thursday those nasty little creatures beckoned to me until I walked trance-like out to the side of the house and began ripping them out with retribution. And they literally beckoned to me; I heard their maniacal titters as I hunched over their spiky heads, for they knew the harder I worked, the faster and more abundantly they’d grow back, especially if I glanced in another direction. But call me dim-witted; I didn’t wear gloves. Whether it’s the bulkiness of the fabric that blocks my sense of touch, or the lack of fashion, or the drudgery of walking all the way to the garage to retrieve them off the shelf, I just won’t wear them. As a result, twenty minutes into my love fest with these pests, a blister formed on my index finger, a wound that is still quite tender as I type this post. Why do I put myself through such torture, when I know my salvation (my gloves) is only a few yards away? For one, I love the feel of freshly-turned dirt in my hands. I also get a better grip on the objects of my aggression. After a week or so, the blistered spot eventually becomes hardened, providing me a tougher surface with which to attempt the task again, provided I don’t let too much time pass before my next visit. However, in the midst of the resulting jagged fingernails and worn skin, all pain is forgotten when I experience the end result: a colorful garden, the fresh smell of overturned earth, thriving plants blooming in their weed-free environment. "And what is the point of this gardening lesson?" I hear someone ask. My answer: It reminds me of writing. Often my writing contains an abundance of weeds. Nasty little problems like clashing points of view, passive voice, messy grammar, and flat scenes that fail to advance my plot. They are nuisances, and sometimes they take over before I realize they are even there. Maybe my gloves, the bits and pieces of research, the help of a writer’s group, or the expertise of a dictionary, are available to me, but I am too embarrassed to ask for help or too lazy to get up from my chair, and there is so much research to do that one more fact about Newaygo, Michigan will clog my brain beyond repair. The inevitable blisters eventually form, like writer’s block or unwanted scenes that have to be thrown out. I realize some of the blisters might have been avoided with a little more preparation, or more motivation, maybe even less pride. Call me crazy, but I, for one, welcome the blisters. They force me to take a different approach or to seek the help of another author, and as I deal with the pain, the blisters toughen me and make me a better writer. Sometimes the ache comes close to breaking me, but, oh, how I love the feel of the keyboard beneath my fingers when I come back after a break. And the best part of working through the pain is how glorious my manuscript turns out when I finally complete my work. Words and the way gifted writers use them have always fascinated me. This fact had everything to do with choosing the name of my blog. An author who crafts a paragraph that makes my mouth salivate, my nostrils flare and my eardrums thump is usually as expert at conjuring up images that I can almost see and long to touch. When I read such poetry, I can hardly sit still until I throw down the book, run to my computer and start hacking away at my keyboard, hoping to create something as magical. 1. Include plenty of sensory language to enhance or define the main theme. 2. Use details which go beyond the ordinary. 3. Use words that enable the reader to see what the writer is describing. --The hay made, all golden in the low afternoon light. 4. Use figurative language such as simile, hyperbole, metaphor, symbolism and personification. 5. Use active verbs and precise modifiers. 6. Organize your details-- Some ways to organize descriptive writing include: time, location, and order of importance. When describing a person, you might begin with what they look like, followed by how that person thinks, feels and acts. For our writing’s sake, applying descriptive methods to paint word imagery across the pages of all our essays, articles, short stories and novels is vital to our success as a writer. The knack may or may not come naturally to us, but if we will daily practice turning our mundane sentences into vivid, lively passages and master the above proven techniques, our work will breathe life into those who read it. I'm a charter member of ANWA, the American Night Writers Association. I was one of five women who met on that inaugural night twenty three years ago in the back room of the Gilbert Public Library, and with our founder, Marsha Ward, shared feelings, hopes, and desires about writing. Through the years I've been newsletter editor, webmaster, conference committee member, chapter president (twice) and designer of the original ANWA logo. I was immersed, so to speak, in the workings and dealings of the group responsible for throwing me a life preserver and helping me reel in my first book from the murky waters of non-completion to contract. So what happen to my good intentions? My hope of publication? But for the short anecdote in Michele Garvin's By Small and Simple Things, a winning entry in an American Mother writing contest, and a few articles in the Latter-day Sun and The Beehive, I'm still treading the unpublished waters of the writing world (yes, I lost my book contract). I wondered why, after all the miracles I had experienced through the course of writing my novel, I was forced to jump ship and start swimming again. Choking and gasping for air, I surfaced long enough to send out my manuscript to other LDS publishers. Even my previous editor championed my work, hailed additional publishing houses, and provided new opportunities to be saved. No one bothered. So I quit writing. I let the waves of divorce and water-logged self-esteem roll over me. I even abandoned my beloved ANWA, while all the talented sisters who had supported me from the beginning, and a shipload of new ones, started publishing, blogging and signing books. I watched with tears in my eyes as the Good Ship ANWA sailed off into the sunset. Funny thing about self-pity, it fails to build self-esteem. Neither does it heal broken hearts or write books. And not to be trite, but sometimes when a ship's hatch closes, somewhere a portal opens. The powers-that-be often chart courses that take us to entirely different ports than the ones we chart for ourselves. To my surprise, my first novel is breaking headwaters to new adventures. And as I begin other projects, I realize my previous effort was not wasted, but was the springboard to faith in my Heavenly Father's promises and in my own abilities. Such is my current outlook from the bobbing depths of where I tread today. 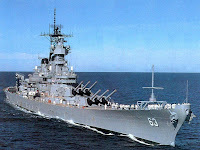 I can see calmer waters ahead. And though I'm busy filling my cargo hold with the how-tos of blogging, Internet networking, and the myriad ways of publishing in the ever-expanding writing/technology ocean, this post is proof that USS Peggy is, again, underway.